We are a small family-owned tour company based in the beautiful colonial city of Merida in the southern state of Yucatan, Mexico, specializing in private day excursions in and around Merida. All our day trips are led by Alex Aranda, a highly-experienced bilingual tour guide (English/Spanish) and certified driver, who moved from his native Mexico City to the Yucatan Peninsula over 35 years ago, and has been living and working in Southern Mexico ever since. Before bringing his expertise and unique style of guiding to the Yucatan, Alex led cultural tours for many years in the maya highlands surrounding San Cristobal de Las Casas in the southern state of Chiapas, where he received the Trip Advisor Award of Excellence for his work, as well as recommendations in many major travel guides, including Lonely Planet, Fodors and Frommers. Alex founded Destino Merida with his British wife Joanna so that he could share his favorite travel experiences in the beautiful state of Yucatan, and his trips often take you into the heart of the countryside to magical places you may not have discovered on your own. Alex specializes in private tours with groups no larger than seven people so that he can offer a truly personal and friendly service to those travelling with him. Today we must travel back to the states and we are sad our visit here is coming to an end, however we have special memories to carry with us. Alex was a superb tour guide and companion as we spent the whole day, Tuesday, visiting Uxmal, lunching at the beautiful hacienda Ochil with special care given to our plant based diet, an amazing refreshing dip into cenote X-Batun, and finally the walk-about and exploration of hacienda Yaxcopoil. Our heads are spinning with so many new worlds and new words. We loved Alex's enthusiastic energy and felt safe in his hands as he translated for us and drove us to the special places. He seemed to have the magic touch and we always seemed to arrive at the tranquil destinations before crowds of people thus our experience was even more special. 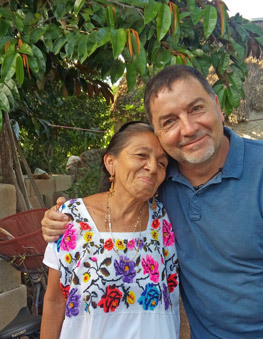 John and I both want to thank you for a very special day in the Yucatan wandering among the Mayan people. If I may speak for John, he has had a very memorable birthday celebration. Our best to you both.